The other day my fiancé Mark and I went to a French restaurant near our home. The hostess wore white jeans with a billowy blouse and high-heeled sandals. I loved the contrast to typical (black) restaurant staff attire. It just gave off such a cool, elegant vibe. And I have to admit, I experienced pangs of envy. My bottom half is curvier than my top. And so, I avoid accentuating the disparity with lighter-colored skirts and pants. During recent trips to New York and Milan, I spotted more summery looks with white jeans. Some, as illustrated by two New York (below), were dark on top and light on bottom. That’s the polar opposite of my usual color placement. Clearly, these women have the physical proportions to pull off the look. And it’s a classic! The all light-colored ensemble of this next New Yorker is dazzling. I love the way the orange of her sandals and handbag pick up the peach tone of her tee, while the gold sandal strap adds a bit more polish. An all light-colored look is a particular winner for those of us with tiny torsos and generous hips. 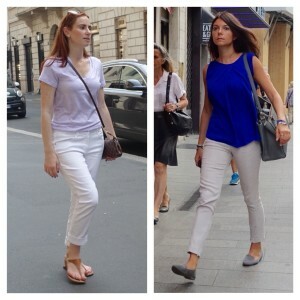 Our final two muses from Milan also show fabulous white jeans looks. The woman to the left- in all light colors – tastefully accessorizes her outfit with Louis Vuitton crossbody bag and saddle brown sandals (accentuating red tones in her hair). And the woman to the right pulls off some cool color blocking. Wearing three different hues/shades is a great recipe. I love the way these women each dons a handbag/footwear combination, making up one of three hues/shades. After seeing these stylish ladies, I simply had to go looking for those elusive white jeans. Obviously, fabric and cut vary enormously from one pair to the next. And so I was thrilled to find a large selection at Nordstrom. I scored a pair in stretchy denim with straight legs. They fit me perfectly! That is, after a little tailoring at the waistband. Once I got them home, I tried on the jeans with different tops. Pairing them with a bright red top was unfortunate. The two different colors broke up my silhouette, causing my hips and legs to look disproportionately larger. Notice the glow? When my white jeans are hit with sunlight, the lower half of my silhouette expands. 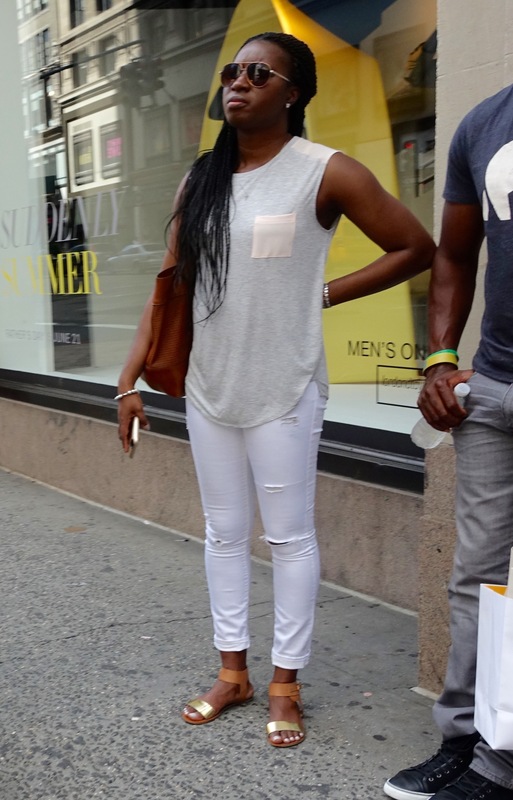 The winner: white jeans with ivory sandals and blouse. The continuity of color – nearly all white – lengthens the silhouette, while the ruffle of the blouse and its slightly cinched waistline definitely brings me closer to the desired hourglass look. I am now on the lookout for a top and sandals of a very light shade but slight hue (and accessories to match, of course). It is so nice to know that there are no hard-fast rules when it comes to style. Women with shapely or muscular legs need not be restricted to dark trousers. 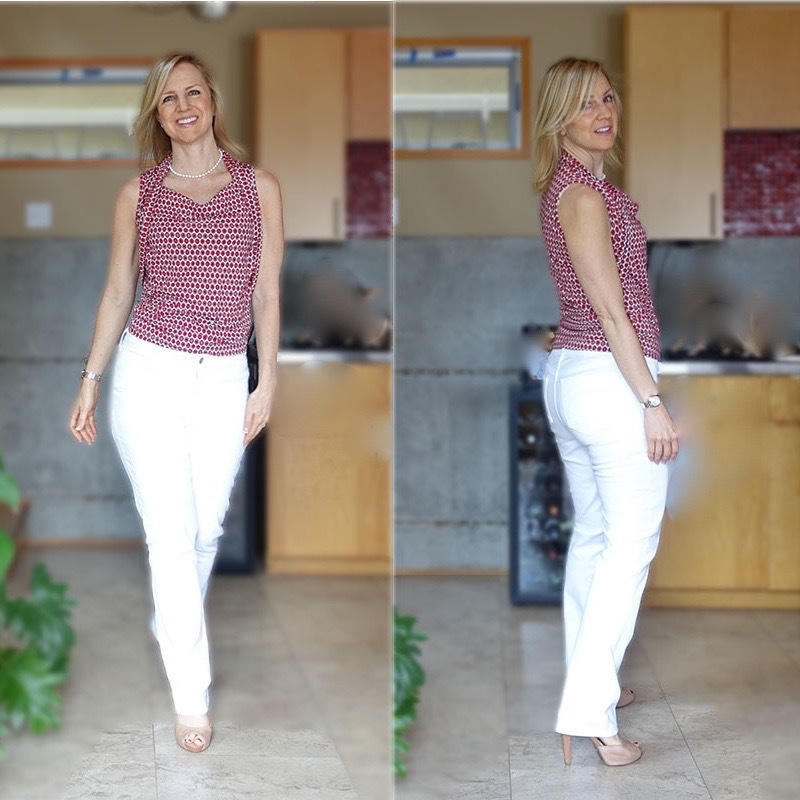 No, with just a bit of tweaking, even the pear-shaped among us can pull off white jeans!